at 29.03.14 Price of Essar Shipping is 15.28 , Now CMP on 17.04.2015 is 21.85, So we get 42.99% Tax Free long term capital gain in this trade. I would like to know about the SRS LTD. Is it a value buying or not? Am holding most of your recom. Share for long term. Presently SRS ltd informed bonus share, So we have to book profit with the bonus or there is a lot of steam left? And happy to see all this share am in profit till now,but as per your book 15% is minimum profit we have to book. Other than penny stock holding Gillanders arbut ( kothari group @48 RS - 100 share). Question 1 : After srs bonus it may go to slow zone, so that we can book profit and buy after 2 year? Question 2 : Any target for other shares which i mentioned here. Mic electronic is good one for long term? 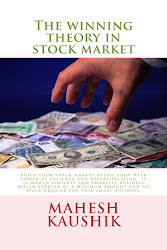 I am not give any target on my recommendations because if you read my book then you may understand then it is always wise to book profits and rotate money when our holding cross 15%+ profits. Srs future view after bonus share?